Upside Down (2012) made next to no splash upon its release, not even managing a cinematic run here in Australia. With its arresting visuals, great concept and a schmaltzy love story featuring Kirsten Dunst, I find it pretty hard to see why. For me personally, a fantastic bloody concept and awesome visuals get a film a long way. Upside Down features both of these things and whilst perhaps it could have done something a little ‘bigger’ with all of this, the film is still really satisfying. Actually perhaps that is part of the charm. All of the big ideas that could have been examined are actually a little secondary here, with the focus being on just a good old fashioned love story. 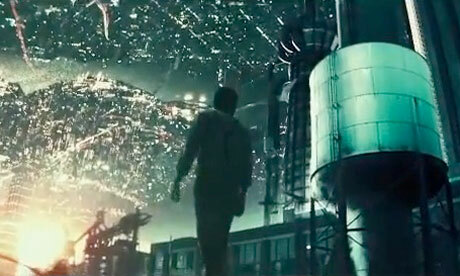 The film takes place in a world that looks a fair bit like ours. However there are actually two planets sitting right next to each other, sometimes mere metres apart. The upper classes, including a manipulative energy giant, live on one planet with the lower classes on the other. It is refreshing that the focus is simply on lovers from these two worlds trying to be together (which is forbidden), rather than on ramming home some grand societal statement. The two lovers are played by Kirsten Dunst and Jim Sturgess. Whilst the former has the bigger profile, it is Sturgess who has the most prominent role in the film. Interestingly for much of the film the periods that Dunst and Sturgess share the screen (which is not all that often) are probably the least enjoyable. It is a little average and schmaltzy. Credit to writer director Juan Solanas though, because this is overcome as the film progresses and the end to their love story, whilst entirely predictable, is also entirely satisfying. I think part of this is because the material gets more interesting as the story spends more time with them apart, focusing in on the life of the Sturgess character to build to its conclusion. Both Dunst and Sturgess are really good in the film. Their performances are likeable and Sturgess shows he can really carry himself on screen. He doesn’t come across as some cookie cutter presence on screen either, has a distinct persona which it would be great to see more of. I only saw the film at home on DVD but I would have loved to have been able to see it on the big screen. The film looks both whimsical and fantastical, going to great effort to explore the visual opportunities that the concept presents. The whole film, presumably basically all shot on green-screen, looks great and there are some particularly arresting pieces of imagery. The office where work cubicles are on both the roof and the floor, nearly touching each other is one such example. Clearly with the competing gravity of the two planets there are plenty of laws that govern the action. Whilst these are explained a number of times, you are better off just ignoring them really and going with the flow. Like many a time travel film, if you get bogged down trying to work out all of the ramifications of various actions, you will end up doing your head in and missing out on much of the enjoyment that the film brings. 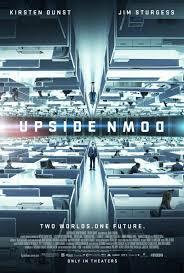 Driven by two fine performances and fantastic visual design, Upside Down delivers on all fronts. Both a really nice love story and a ‘soft’ sci-fi tale, it is a really enjoyable film that also features one or two things that have probably not seen elsewhere. Nice post! Never even heard of it. Looks awesome, thanks for the head’s up. Cheers Cindy. Yeah it was a really cool flick. I want to see this…. Loved this movie! The visuals were amazing 🙂 Great review! Cheers Kim, glad to hear you enjoyed the film. Twas very pretty as you say.